Are you ready to catch the next generation of Pokemon? Each Pokemon Trading Card Game: Sneak-Peek Tin contains 1 of 3 NEVER-BEFORE-SEEN basic Pokemon preview cards from the Pokemon TCG: Black & White expansion-the Grass Pokemon Snivy, the Fire Pokemon Tepig, or the Water Pokemon Oshawott-but that's not all! You also get Snivy, Tepig, or Oshawott as a collectible figure! Want more? Each tin also contains a special Black & White preview pack with 5 more NEW Pokemon! On top of all of this, you get 4 MORE Pokemon TCG booster packs from Call of Legends, the HS Series, or the Platinum Series! 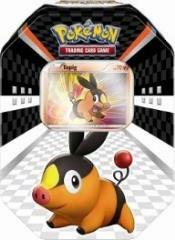 1 of 3 never-before-seen Pokemon-Snivy, Tepig, or Oshawott-as both a TCG card and a fantastic figure! A special preview pack for the Pokemon TCG: Black & White expansion-five Pokemon chosen just for this sneak peek! 4 more Pokemon TCG 10-card booster packs from previous releases!